AQUA MODESTA maternity style 2606 is designed as a four piece swim set. 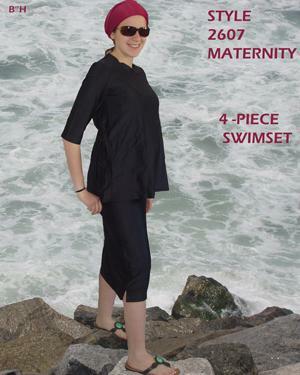 The top is designed to expand as you grow throughout the pregnancy. The side panels open up with two bands that can then be tied into a bow. This serves as a perfect yet functional detail. Underneath the top is a sports -bra that is lined and has soft cups. Designed with extra room for more ease and comfort. The skirt has an elastic waist and a brief is sewn into it. Although it is a pencil design, there is extra fabric allowance for greater comfort. The material feels great and the turquoise color is gorgeous. I found the suit to be very comfortable. There's definitely room for your belly as you grow.